Citizens are trying to prevent construction vehicles from entering and exiting Camp Schwab at 11:40 a.m. on April 10, in Henoko, Nago. 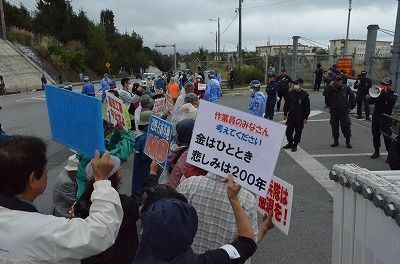 On the morning of April 10, the Okinawa Defense Bureau (ODB) conducted maritime work towards construction of a new U.S. base in Henoko, Nago, which is part of the plan to move the U.S. Marine Corp Air Station Futenma in Ginowan. In front of the gate of Camp Schwab, about 50 people staged a sit-in protest to block materials for the construction from being brought into the base. At 9:00 a.m., the riot police forcibly removed sit-in protesters as vehicles carrying construction materials arrived at Camp Schwab. About 30 vehicles, including dump trucks carrying crushed stones and sediments and concrete mixer trucks, entered the base. At 11 a.m., the scene was chaotic for a while with protestors gathering in front of the gate to block the construction vehicles and U.S. military vehicles. At sea, as of 10:00 a.m., work on spreading floats towards Sedake beach was confirmed to have taken place. Following this work, the ODB will likely install pollution prevention membranes.